The 300 days of discovery in the lawsuit filed by the trustees of the New Jersey Lawyers fund against Fort Lee GOP Fundraiser and disbarred attorney, Vinnie Leonelli-Spina, continues to countdown. 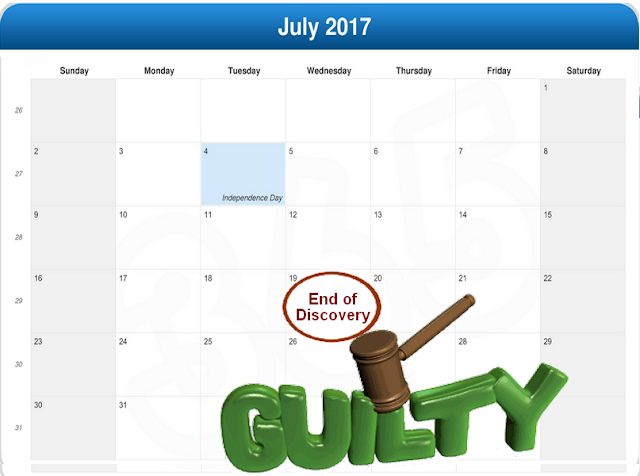 There are now 128 days of discovery left before the jury trial is scheduled to start. The New Jersey Lawyer's fund is suing Leonelli-Spina for monies it paid out to her former clients after she was disbarred for misappropriating client funds. Misappropriation of Funds is a form of theft where an attorney spends the money that a client entrusted her with. While the discovery was going on, Leonelli-Spina was appointed chairperson for the Fort Lee GOP fundraising committee. That's certainly a case of letting the fox guard the henhouse. I tweeted the person who appointed Vinnie to ask why she did that. Her response was to delete her Twitter account. Also during the discovery Vinnie and her husband, Patrick Spina, were defendants in another lawsuit where they were found guilty of misappropriating funds from their former law firm partner. The New Jersey Lawyer's Fund paid out over $300,000 to Leonelli-Spina's former clients. With 300 days of discovery, they're sure to find out where the money went as well as find out where Vinnie's assets have gone. Thank god New Jersey has something like this, a fund for clients who wronged by crooked attorneys like Vinnie. You know what I find crazy? One of Vinnie's many claims in Albro's case is; the settlement and ATTORNEY FEES he was awarded was eaten up by hours billed. If I am suing someone for $2,000 let's say I am a landlord, my attorney knows the amount I am suing for, an attorney would Charge a fee upfront (regardless of what state) or if they thought the case was winnable they could either do a rip off contingent fee or ask for the fees to paid by other party. In this case, the fees were paid by the other party and Vinnie felt she was somehow entitled to over almost $400,000 + $160,000 fees awarded. When that didn't work, she tried to blame a bill keeper. I would like to see what she made in between his case, I bet she didn't come near that number minus the money she embezzled. Sorry I keep commenting. I am recovering from surgery with my feet up and your blog is cracking me up.